Mark your calendar – Sherry Serafini is coming in September! Home / Mark your calendar – Sherry Serafini is coming in September! My, oh my! Sherry Serafini is coming to teach for us in September. Three fun filled days of bead embroidery classes. 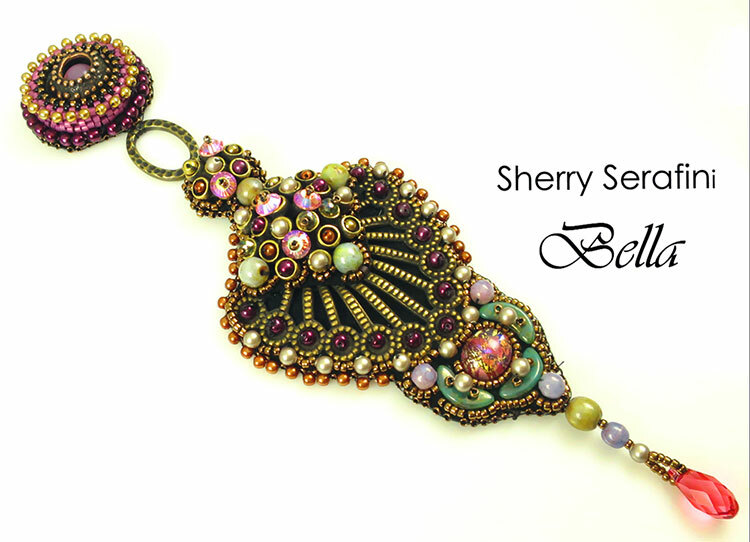 Sherry is an icon in the beading world. She’s taught lots and lots of people to make beautiful jewelry and it’s all totally doable. She’s sold finished pieces to celebrities. So many cool feathers in her cap. She’s talented and warm and friendly. How can you go wrong with that combination? Can you tell we are excited? 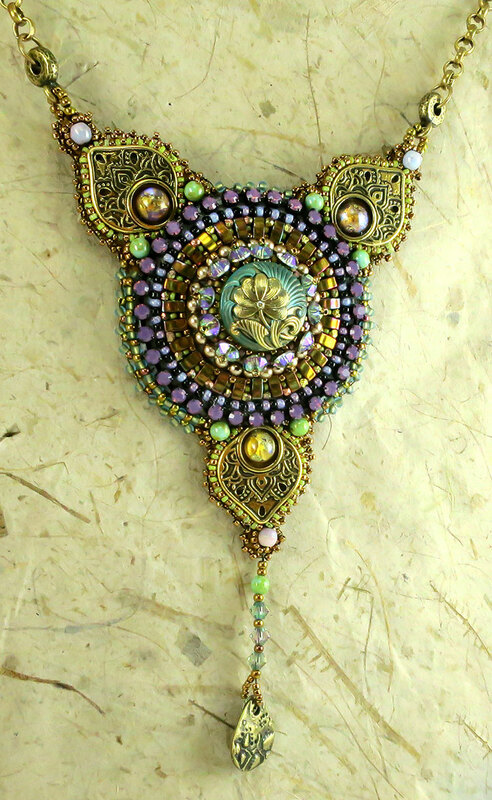 Join us and make a beautiful bead embroidered pendant utilizing a wooden ring armature, Czech button, Tierracast drops, cup chain, cabochons and seed beads. Neckpiece hangs from chain and closes with a lobster claw clasp. 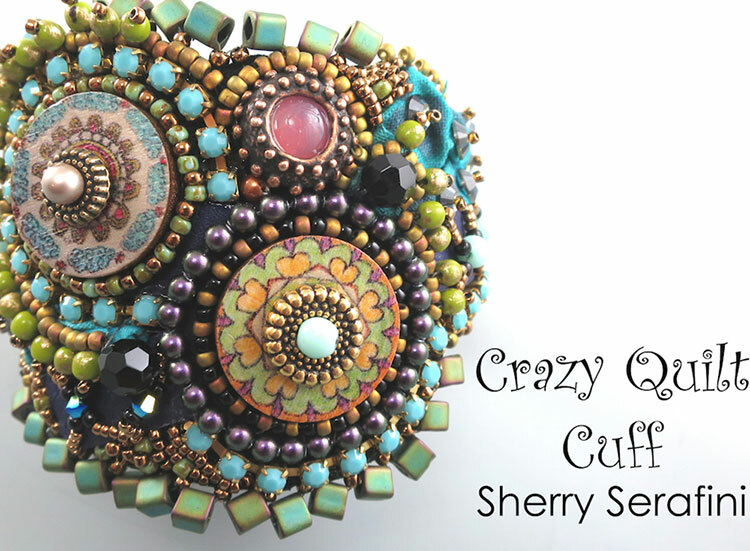 Bead embroider a fabulous, funky and fun cuff using buttons, leather, cup chain and various embellishments. This class is a design oriented class while exploring mixed media. My favorite thing about this cuff is that you can size it to fit, narrow or wide this is your creation. Bead embroider an elegant necklace that utilizes Annabronze© bead caps, Swarovski elements, wooden ring and more. Embroidery, peyote stitch and edging are the stitches explored. Sherry’s classes always fill fast so check your calendar and give us a call to sign up. We’re going to have a great time.